Homepage Accessories Reviews Sony Ericsson SmartWatch: Practical or Tacky? During CES 2012 Sony Ericsson had a new accessory to show off in the form of a new Bluetooth watch that can apparently play nicely with most Android smartphones running Android 2.1 and above and is called the Sony SmartWatch, so one can assume that Sony has now dropped the Ericsson part of the name. The guys over at Engadget were on hand at the event to have a look at the Sony SmartWatch, which is the successor to the LiveView and can apparently be detached from its rather bland strap and transplanted to any other watchstrap if you prefer. The device itself is connected to your handset via Bluetooth and can answer calls, play music, act as a notifier, and allows the user to check on their social networks such as Twitter and Facebook and all done by a new app running on your phone and controlling the SmartWatch. With typical usage the battery life of the Sony SmartWatch is said to last four days, which seems very reasonable to me, the device sports a capacitive touch screen that works well although when asleep you need to tap the side button to wake it up. 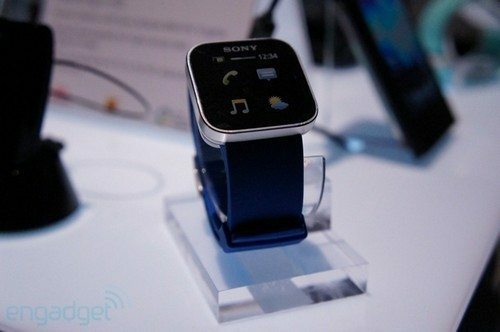 As for that rubbery strap, Sony says there is several colour options available on launch, which should be sometime this quarter, and the Sony SmartWatch should command a price tag of about $149. So is the Sony SmartWatch a practical device? Personally I have to ask why would anyone want a SmartWatch if they have a smartphone to do all they need anyway, perhaps it’s just a lazy mans way of not having to take his phone out of his pocket, and to me it does look to be a bit of a tacky looking device that could do with a bit more polishing, what do you think? We have a couple of videos of the Sony SmartWatch for your viewing consideration below, one from the guys over at Mobile Syrup and another from Solider Knows Best, so don’t forget to check those out, and feel free to let us know id the Sony SmartWatch is a device for you or not…enjoy. I’m not enoying that spelling mistake at the end! But I do want one! I would love one of these, 1) as a watch and 2) as a remote for my Android SGS2 music app. I currently use the Samsung bluetooth stereo headset, but this would be great for changing tracks, adjusting volume etc, right on the wrist!! I’m a Dentist and it will help me while in the middle of a treatment showing me if either the call is important or not. So i’m definitly buying one… and it seems to have a very good looking. When technology gets good enough for this to have built in wifi AND to act as a phone, I’m all in. I hope this is much improved over the old LiveView as no matter how you used it (or not), the battery would run out in about 6 hours, despite claiming double-digits on the box. It was also too slow and clunky, which already looks vastly improved in the videos above. Though even if it works perfectly, its still rather pricey when you consider all the clever stuff is actually happening in the app on your phone.